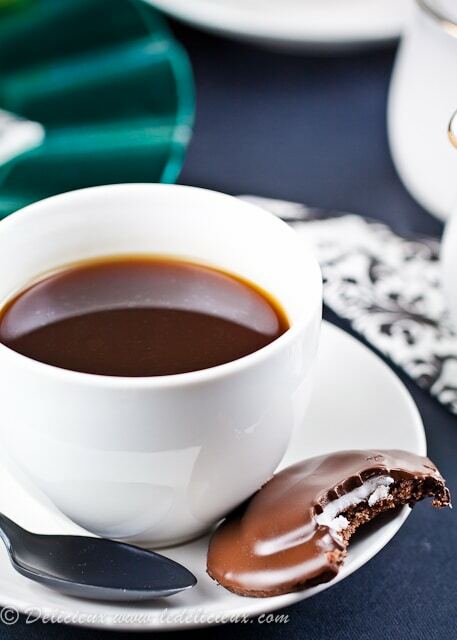 Are you a fan of Arnott’s Mint Slice? 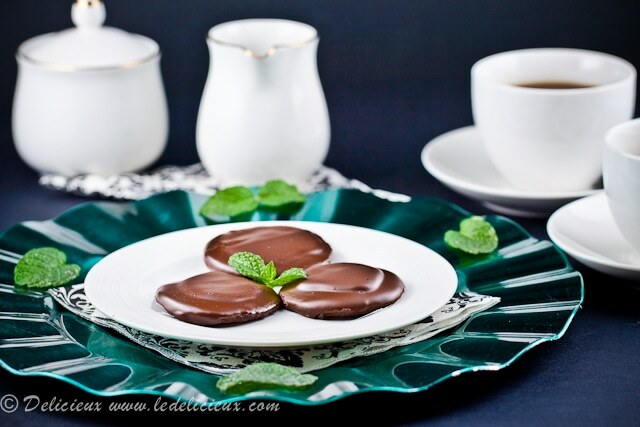 For my international readers, Mint Slice is a delicious chocolate cookie topped with a mint cream and coated in dark chocolate. Mint Slice is one of Troy’s all time favourite biscuits, so I wanted to try my hand at creating my own version mint slice. I started with a crunchy chocolate cookie base. One of the great things about a mint slice is the combination of textures. The base is crunchy, then it has a creamy middle and chocolate coating. So with the base nailed down I decided to tackle the filling, and for this I went with a simple combination of icing sugar and peppermint flavouring oil. The peppermint icing was spread over the top of the biscuit and left to set. Once set the whole cookie was dipped in a bowl of melted dark chocolate and left to set. The only thing that didn’t go according to plan was the fact I happened to pick two especially humid days in Brisbane to make and photograph my creations. Melting chocolate aside, my cookies taste pretty close to the real thing. While I’ll admit making your own Mint Slice at home is a little fiddly, the great thing about it, apart from knowing every single ingredient that goes into making it, is the fact you can increase or decrease the intensity of the peppermint to meet your tastes. You could even substitute the peppermint flavouring for another flavouring essence. I think next time I’m going to try an orange flavouring……mmmm chocolate orange! An ode to Arnott's Mint Slice Biscuits. Makes 24 cookies. Preheat the oven to 180 celsius (350 farenheit) and prepare two baking trays by lining them with baking paper. To make the cookies, combine the butter, sugar and egg yolk in a food processor fitted with a steel blade and process until well combined. Add the flour and cocoa and process until it starts to come together in a ball. Remove the dough from the food processor and divide into two and flatten into a disc and wrap each disc in cling film and refrigerate for an hour. Remove one disc of dough from the refrigerator and roll out between two sheets of baking paper until approximately 6mm thick. Using a small circular cookie cutter cut circles from the dough and place onto the prepared baking tray. Bake for 8 to 10 minutes. Roll out the second disc of dough while the first is baking and then bake that when the first tray is done. Leave the cookies to cool on the tray until firm and then place on a wire wrack to cool. Once the cookies are cooled make the peppermint cream. Combine the icing sugar, peppermint essence and hot water until it makes a smooth spreadable paste. Spread the icing mixture onto the cookies and leave to set. Once the icing has set, place a sheet of baking paper until the wire wrack to catch any chocolate drips. Melt the chocolate over a pot of simmering water and once melted remove from the heat. Dip each cookie in the chocolate and return to the wire wrack to set. I used Peppermint Essence from <a title="Peppermint Essence" href="http://bakingpleasures.com.au/p9030/peppermint-essence" target="_blank" rel="nofollow" data-mce-href="http://bakingpleasures.com.au/p9030/peppermint-essence">Baking Pleasures</a>, which I found quite strong. You may need to use more or less peppermint essence depending on the brand you use. Tried these, and I must confess… your recipe has more mint flavour than Arnott’s (sorry Arnott’s, I do still love your Mint Slice!) Think I added more too so that could be why. Think I might try covering the cookies all over in choc sometime, maybe I’ll get them to last longer. As if that would happen, they practically evaporate! These would be my downfall. They look amazing! Very compelling cookies! We just ordered Girl Scout cookies from our neighbor ‘s daughter. Although we ordered the Thin Mints, making them from your recipe would elevate the minty chocolate goodness to another realm of cookie bliss. Just spectacular! Love love love mint slices!!! The Boy won’t go near them. But I love this! The cookies look incredible and love your presentation too!!! You may already know , but just in case I discovered cherries direct a couple of weeks ago. Honestly the cherries were so delicious, and delivered to my door. Coles cherries will never seem as nice again. Only wish I’d discovered them at the beginning o the season. Love the sound of the orange flavour. Home made jaffa slice yum. Chocolate and mint is such an interesting flavor combination. I somehow could never fall in love with it but these cookies and the glaze on top is just too tempting to let go. 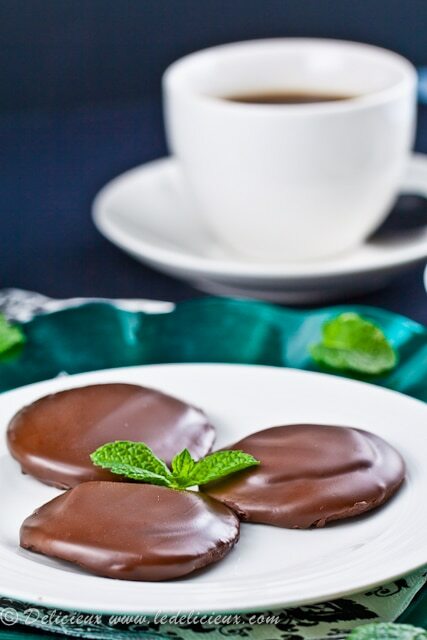 These mint slices are similar to an American cookie called Thin Mints, which are sold as a fundraising effort by The Girl Scouts. I’m sure yours are way better because they are not filled with ingredients you cannot pronounce! I’m definitely making these for my kids and will put them into the freezer just like I used to do when I ate those Thin Mints. They’re SO good when frozen. I’d never heard of Thin Mints, but I’ve heard a lot about them since posting this recipe. I’m curious to try them to see how close they are to our Mint Slice biscuits. These luscious mint cookies remind me of a “way better version” of the mint girl scout cookie. These look so elegant and tasty! Yummmm! Am I a fan of mint slice? YES YES YES!!! They are my all-time favourite biscuit that you can buy. I will most definitely be making these at home. Great job you did Jennifer! I love mint slice cookies too-more than Tim Tams (can I even say that without having to give back my Australian citizenship? :P). yum yum! I love the look of these cookies. Oh..these cookies look absolutely stunning, and mint is such a wonderful addition! Hehe thanks Jas 😀 Wow lammingtons…I haven’t had a lammington in forever! These look so perfect. I cant wait to make them…… I hope they look like yours! These are just gorgeous! I’ve never had Arnott’s Mint Slice but I love thin mints (a kind of girl scout cookie!). Anyway, would love to give these a try they sound delish. I used to love those after dinner mints with the mint filling and the chocolate coating. This reminds of them. I’ve never had a Mint Slice but I have seen them here, I’ll have to check them out. I purchased my Peppermint Essence online at Baking Pleasures. They deliver very quickly. Wow, your pictures are amazing. I wish I had all the ingredients at home, I’d make these cookies right now… They look delicious!!! Gday and big thanks for this recipe! For one of my future parties entertaining at home, these you will see! Like the suggestion of orange too! These are just about the prettiest cookies I’ve seen in a long time! I’m a chocolate-mint kinda gal too, so these are definitely on my list! These are just gorgeous! I could easily plough through a dozen of these in no time. You know I totally love After Eights! Not always .. but as a special treat every now and then and these remind me of them. They look lovely! Here in the States, we have something similar to the Mint Slice Biscuits. We call them Girl Scout Cookies Thin Mints. Sadly, they only go one sale once a year so it is imperative to clean out freezer space in advance of Girl Scout Cookie season to stash a hoard of them. I was going to say the exact same thing! These may be just the solution for the dismal parts of the year when girl scouts are nowhere to be found, and our freezers have been cleaned of any last delicious remnants. YUMMMM!!! This sounds ridiculous! Beautiful pictures Jennifer! Oh Jen, these look divine – what a lovely job you have done! No wonder you were having problems waiting for them to set before you tucked in – I doubt I could have waited! Lovely! They look absolutely perfect!